ASA NAG Synchro day three saw Reading Royals SSC, City of Bristol SSC, and Rushmoor Synchro SC secure a second consecutive clean sweep of gold medals in the 12yrs and under, 13-15yrs, and 15-18yrs age groups respectively. Rushmoor Synchro SC were also crowed team champions, while Hannah Randall was crowned the overall high scorer of the Championships. The first event of the day saw those who qualified from yesterday’s Figures event competing for national honours in the 12yrs and under Solo competition. It was Reading Royals SC swimmer Mimi Gray who topped the points table with a total score of 132.0826, taking her second gold at the Championships. Gray, who won 12yrs and under Duet gold yesterday, performed to Andrea Bocelli’s Por Ti Volare (Time to Say Goodbye) and showed equal power and grace throughout the routine to score 68.6159. Gray’s Reading teammate Isobel Blinkhorn also impressed the judges with good height and technique during her Doctor Who inspired performance. Blinkhorn scored 62.4348 to take her a total score to 122.0015. It was City of Bristol’s Jessica Smith who secured the final spot on the rostrum, scoring 61.0290 for her balletic and expressive routine Beyonce’s ‘Ava Maria’, taking her total points score to 120.4290. In the 13-15yrs Duet event, it was City of Bristol’s Kate Shortman and Isabelle Thorpe who stood on the top of the podium, taking their third consecutive gold as a Duet pair at the Championships. Shortman and Thorpe, who were named England Programmes Synchro Athletes of the Year at the ASA Aquatics Awards, showed great synchronisation and precision as they performed a powerful and strong routine, which was first performed by Jenna Randal and Olivia Federici at London 2012. They scored 75.2667 to take their final score after yesterday’s figures to an impressive 147.3473. Sophie Freeman, who took Solo bronze yesterday, and Ashley Pearson also showed strong synchronisation with intricate details throughout their Spanish inspired routine. The two Stockport Metro SC swimmers finished on 60.2000 for a total of 123.8972. Reading Royals swimmers Harriete Smith and Abigail Taylor took bronze after a dramatic performance with lots of energy. They finished on a total of 123.4723 after their routine to the soundtrack from ‘Divergent’ scored 62.7667 points. Duet pair, Hannah Randall and Jorja Brown, showed their strong technical ability in the 15-18yrs Duet event with a fast and precise routine with interesting and intricate details. 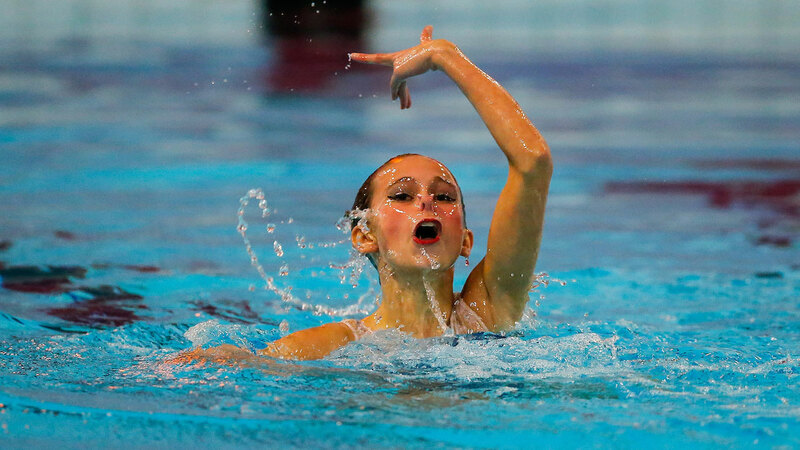 The Rushmoor Synchro swimmers, who represented Team GB at the European Games this year, scored 71.5333 with their own choreographed interpretation of ‘One Thousand and One Nights’ to take gold with at a total of 142.8644. City of Leeds swimmers Abigail Devanny and Rebecca Richardson scored 66.6667 from the judges after a well-executed routine to Alex Clare’s ‘Too Close’. The Duet pair showed great synchronisation and made excellent use of the pool space, boosting their total to 130.5091 to claim silver. It was Rushmoor Synchro SC who claimed the bronze medal, securing their second medal in the event. Alice Bell and Robyn Stanthopre showed great power and flexibility throughout their routine, scoring 66.6667 from the judges and taking their total to 130.5091. After taking gold in both the Duet and Solo events, Reading Royals underlined their dominance in the 12 and under age group with Team gold following a strong routine to the soundtrack from the ‘Moulin Rouge’. The eight strong team were able to maintain excellent height in their figures and show creative interpretation of the music, finishing seven points clear of the rest of the field with 119.9011. Silver and bronze were separated by the tiniest of margins with City of Bristol swam a high energy routine, holding their patterns and presenting with conviction to score 112.5363 for silver. Bronze went to City of Salford with a total of 112.2788. City of Bristol claimed a clean sweep of Championship titles in the 13-15yrs age group following an intense and exciting performance in the Team Event. Their routine to ‘Heart of Courage’ by Two Steps from Hell scored an total of 126.9028 with the eight swimmers showing strong skills in both the figures and lifts as well as maintaining great synchronisation throughout the routine. Reading Royals SC swam an exciting routine to the soundtrack from Disney’s ‘Tarzan’, scoring 120.3375 for silver. The battle for bronze went right down to the wire but it was Stockport Metro SC who edged ahead with a total of 114.6436. The curtains closed on NAG Synchro day three with a confident and polished performance from Rushmoor Synchro SC to claim their third 15-18yrs National title of the Championships. Maintaining high energy levels throughout and executing lifts seamlessly within their routine to the music from ‘Hugo’, the team from Rushmoor scored a total of 138.0061 to secure their place on top of the podium. City of Bristol performed a well-executed and highly technical routine, scoring 128.8219 for silver, while Rushmoor took their second medal of the Team event with a total score of 126.3277 for bronze. The synchro Duet athletes training for qualification to the 2016 Olympics showcased the hard work they have been putting in at training camps. The team, which includes 2015 World Championship swimmers Genevieve Randall and Jodie Cowie as well as London 2012 Olympians Katie Clark and Olivia Federici, performed both the Technical and Free routines for the first time in front of a crowd at the Championships in Gloucester.